Isla Rowntree doesn't sweat running her business too much—maybe that's because she's used to competing in the international spotlight at a cyclocross champ. After getting her very first job in a bike shop, Rowntree skyrocketed to become the British National Cyclocross champ in 1999, 2002 and 2003 and the British Veteran Cyclocross Champion and Cross Country MTB Champion in 2010 and 2011. She knows bikes. 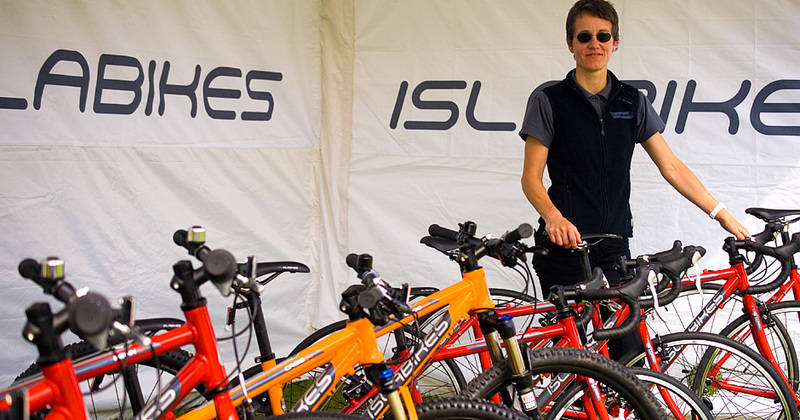 In 2005, Rowntree put her bike experience to work and dove into entrepreneurship, founding the kids bike company Islabikes. Before Islabikes, most children bikes were impractical—too heavy, ill-sized, clunky. Rowntree was the first to develop modern kids bikes that are as thoughtfully made as the ones she raced with. Along the way, she taught herself how to run a business and taught the industry that a woman can run a sports company and make it look easy. Seeing my ideas come to life! My sister and close friends having children and asking my advice on what bikes to get them. There was nothing available I could wholeheartedly endorse. I wanted the children of my nearest and dearest, and indeed all children, to have a better experience of cycling. I’ve not ever thought about it – it’s not a word I would choose to use about myself. I value my ability to see connections in the outside world and apply them to what we do. I don’t feel as if I’ve sacrificed anything. In the early days I lived very frugally since money was tight, but it felt like an investment. I was very motivated so giving up a few things for a while was easy. By thinking of the worst that could happen and imagining how I would feel. If I think I could handle it then I go ahead. A warm fire and a good book. But relaxing is a fantasy – I’m not very good at it! I admire them all. Some of the characteristics necessary to be an entrepreneur are viewed negatively when girls are growing up. Women have to overcome this gender stereotyping in addition to all the other challenges involved in setting up a business. Doing silly things with friends/family. Riding bikes, playing music together, dressing up, being outside. Talking, playing and not taking ourselves too seriously. Isla began riding a bike at age four. She joined her local cycling club at 12 and started working at the local bike shop when she was still at school, so she knows the junior riding scene inside out. As a petite rider, her progress to multiple national and world championship medals went hand-in-hand with developing and building her own custom fit frames and adapting componentry for maximum comfort and efficiency. She tried her hand as a sales rep and then became head of sourcing and design at one of the biggest bike companies in Britain. Her frustration with the cheap, heavy, poorly designed, uncomfortable children's bikes that her sister’s children were struggling to enjoy provided the impetus she needed and Islabikes was founded in 2006. Loved this article? Click here to sign up for Hatch Tribe Talk and we'll keep you in the loop with awesome blog posts, events, and resources for women entrepreneurs.